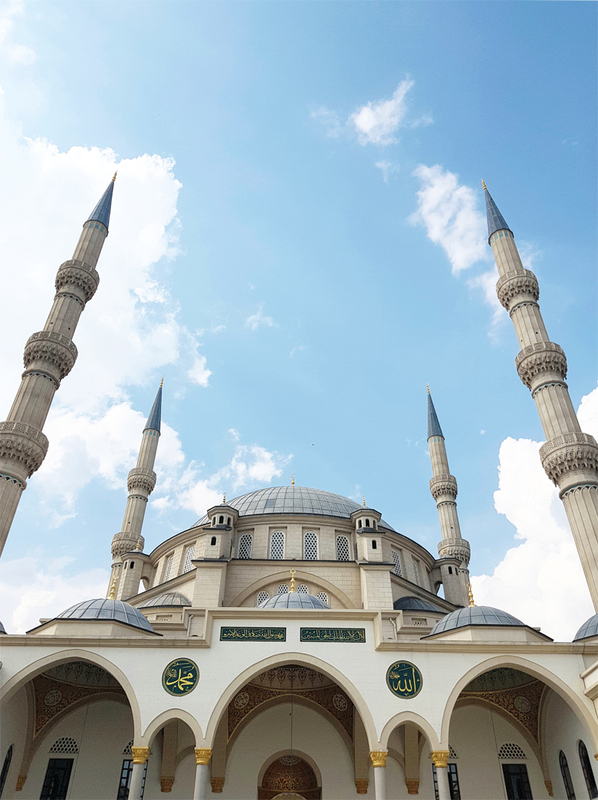 The other day, we drove past the beautiful Turkish Mosque in Midrand and it looked so pretty on the outside, we decided to take a chance and see if could go inside. What we discovered was even more magnificent than we could have ever imagined! It was like we had stepped into a whole new world! The architecture will blow your mind; hand painted ceilings (that will give you a pleasant neck ache), beautiful courtyards, marble columns and stunning painted glass windows all give this building so much character. 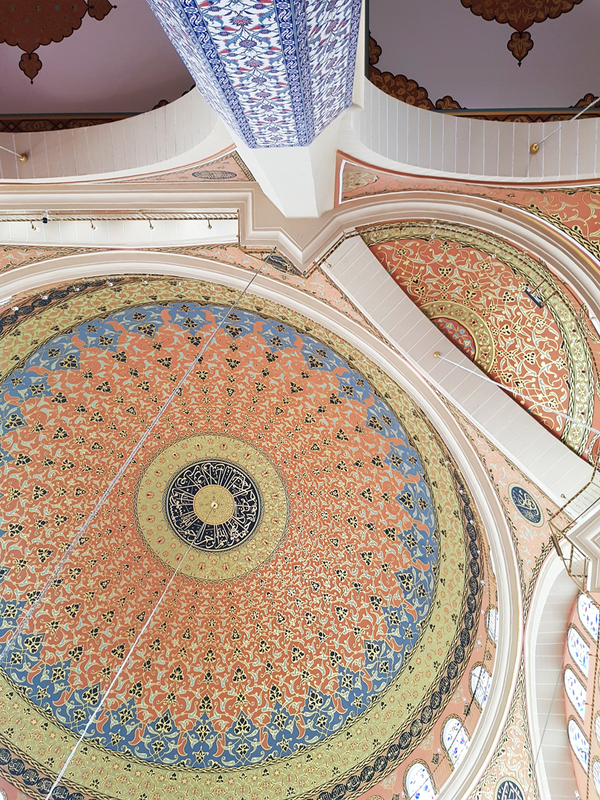 The Nizamiye Masjid is a scaled down replica of the Selimiye Mosque in Turkey and it is every bit the splendid marvel of its inspiration! 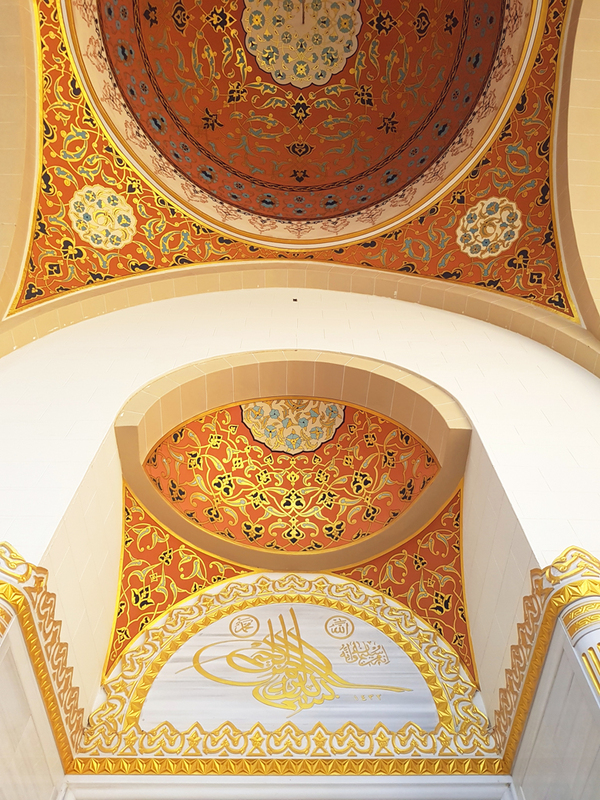 It also happens to be the biggest Mosque in the Southern Hemisphere, with a dome that is rises 32 meters into the sky. WOW is a word you will keep repeating, over and over again when you step into this Turkish Delight! Another thing that made me go WOW, WOW, WOW were the amazing photos I was able to capture on my new Galaxy Note8. Whenever I find myself in a place of epic photo opportunities, I always want to kick myself for not lugging along my DSLR. But it’s so heavy that I tend to only take it out if I’m planning on going somewhere “shoot-worthy”. This little adventure was a real spur-of-the-moment decision that wasn’t planned. But for the first time, I was not gutted that I didn’t have my “big boy camera” because the photos I got on my Samsung Galaxy Note8 came out fantastic! 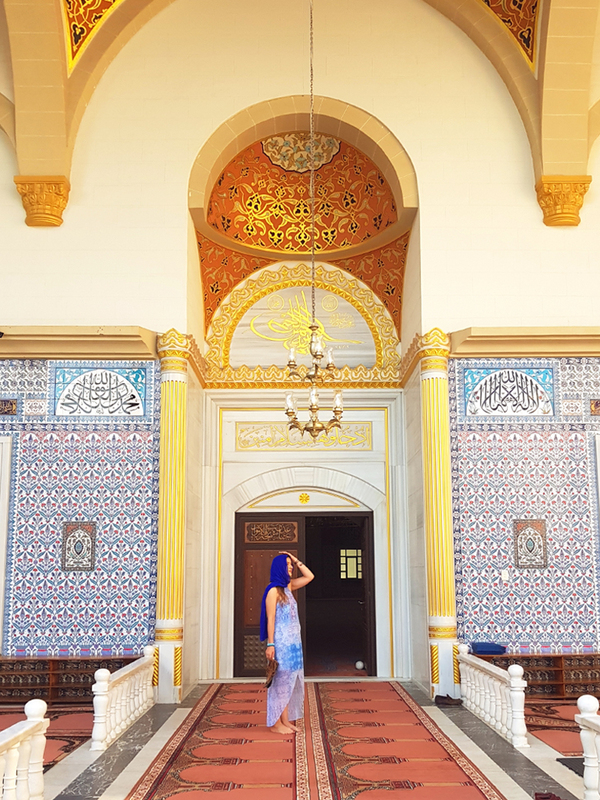 I was able to capture the detailed architecture and opulent colours of the building, and get great lifestyle photos that would make any travellers diary complete. All with my smart phone! And, it’s not just the 12 megapixel camera that makes the shots look professional. The Note8 has dual rear camera lenses; a wide angle (with x2 optical zoom) and a close up lens, so you can shoot in Live Focus to get that pleasant Bokeh effect. Being a really SMART, smart phone it actually captures both the Live Focus and Wide Angle images for you, so you can choose the image that you want best! Or both! You can even edit the amount of background blur on the image before you take the pic, or do it later in post-production on the native gallery app in the phone. For these pics, I didn’t use the Live Focus feature because the background was too beautiful not to include. However, for a typical OOTD, where you want to showcase the outfit and draw attention away from the background, this is such a handy feature that I know I’ll get a ton of use from. Both back cameras have image stabilization, which is something that lacked in my previous phones. I’ve got such shakey hands, it’s often difficult to get razor sharp images, but no problemo with the Galaxy Note8. Even with my coffee buzz, I can snap a shot and it will look perfectly focused. No motion blur to speak of! My BEST camera feature though is Motion Photo, that films a few seconds of the action leading to the shutter button release. When you open the pic in your gallery, you can “play motion photo” and freeze it to get the EXACT frame you want, then save that pic. 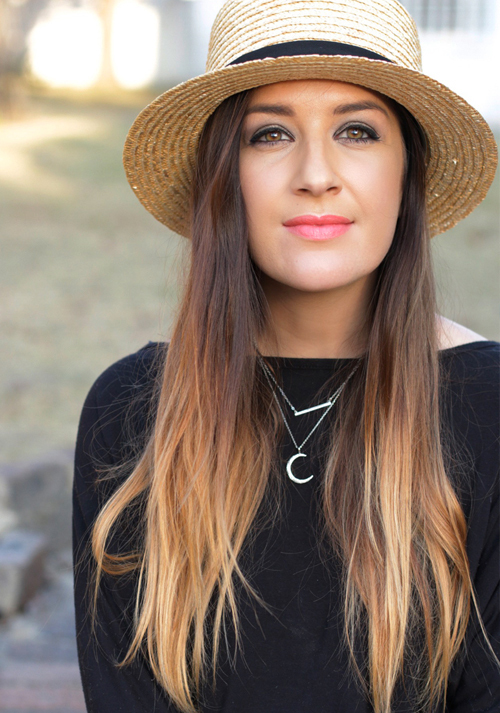 For someone who has been told, time and time again that I cannot sit still in photos, this option is so awesome and will definitely make it easier for my poor hubby to take my photos in the future! The pic above was snapped, played, frozen and saved from frame using the Motion Photo feature. The original photo – with my goofy face- looked so unnatural. So I played the motion until I found a capture I liked, and ta-dah! I nailed what really looks like an effortless pose! Quality wise, you lose a small amount saving captures from Motion Photo but it’s still acceptable for posting online! The original pic was 4032px wide and the frozen frame came to 1440px which is still ok, since I size them down to 780px anyway for faster loading time. I love this little corner of the Nizamiye Complex. I think looks like a mini Cappadocia in Turkey. Obvs the real Cappadocia is something out of a fairytale, but this section has the same feel with its Turkish Rugs and floor cushions. They also have a bunch of traditional Turkish outfits on a rack so that visitors can put them on and dress up for fun and authentic photo ops. 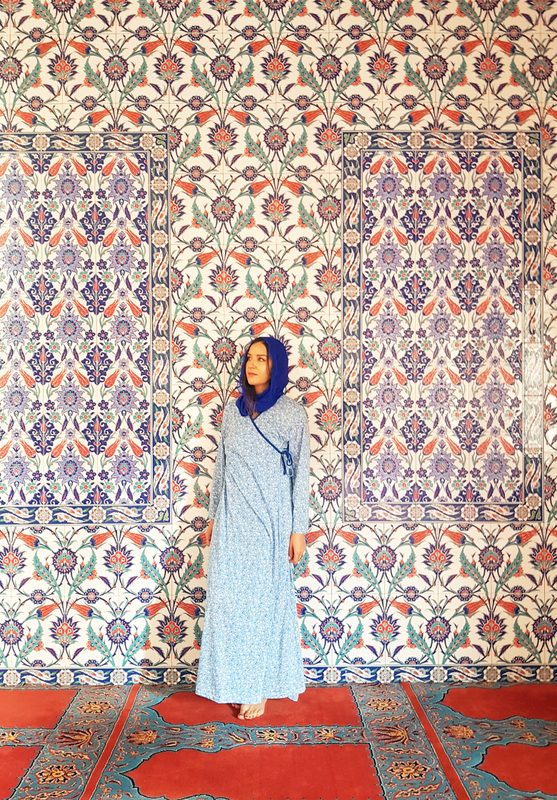 I’m in love with the colours of this… I don’t even know what it’s called – a Kaftan maybe? 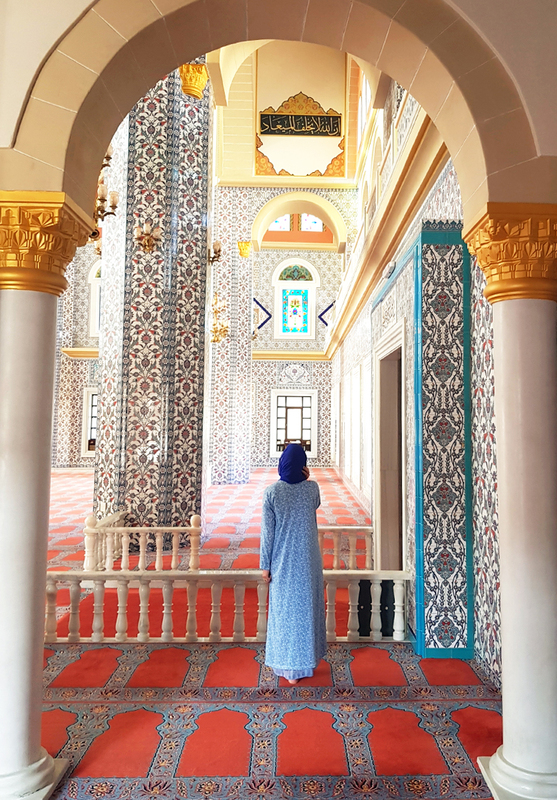 The Mosque – which is in itself a real jewel – is a functioning place of worship and I wasn’t sure if they would let me go inside because my shoulders were bare. But, they had gowns and scarves that visitors could wear to cover up and go into the mosque. Inside it is absolutely beautiful! Words cannot even describe it! When I looked up at the ceiling, I was completely mesmarized! Not just because it truly is a spectacular thing to see, but every little design has been painted, by hand! 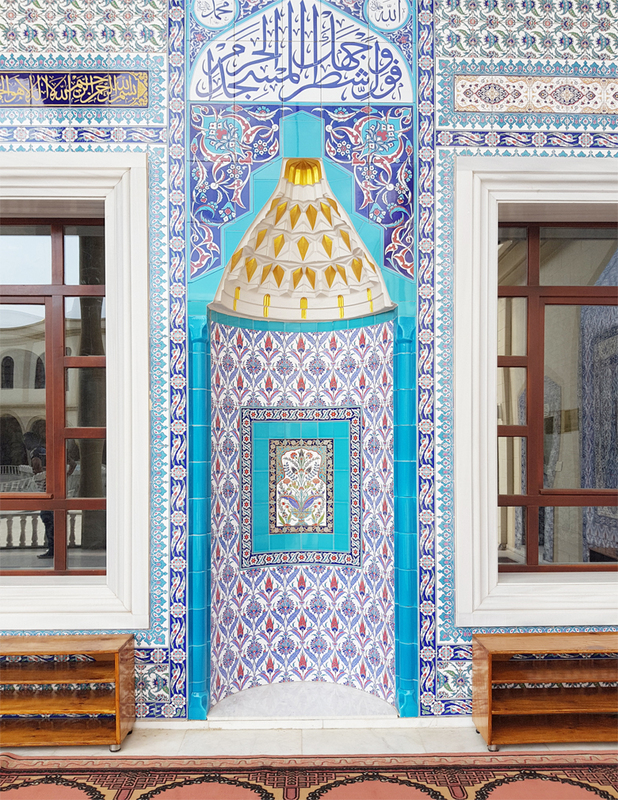 Even this tiled wall is breathtakingly beautiful! Do yourself a favour and go and check it out. 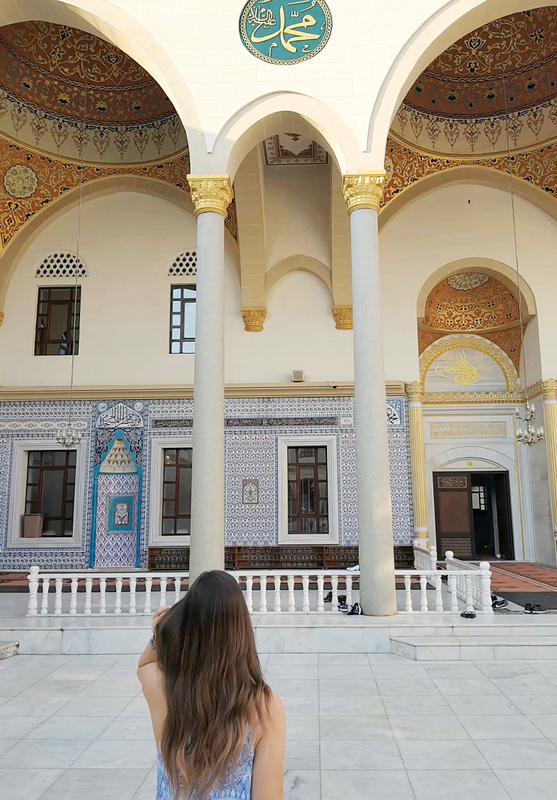 We went completely unplanned and were lucky enough to get a tour of the mosque complex and learn about the Ottoman cultures and traditions. 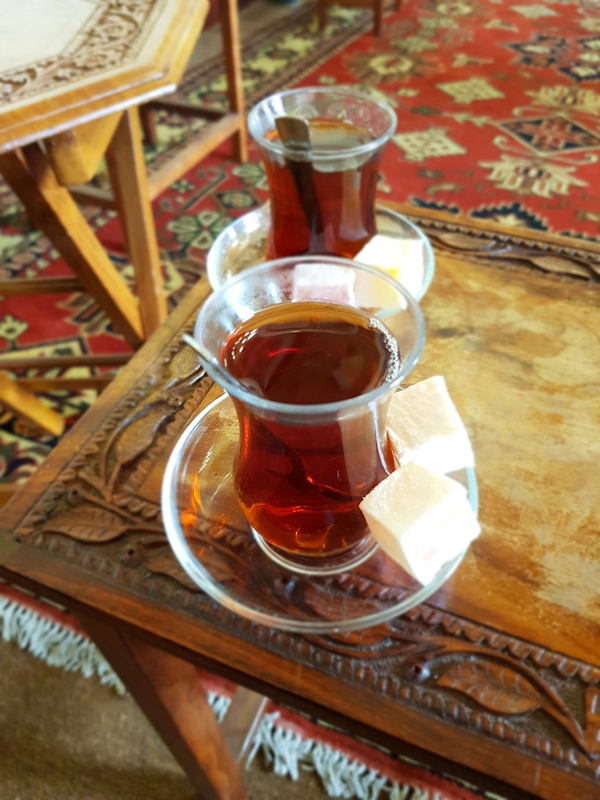 We even got to sample real Turkish Tea and of course, Turkish Delights while sitting in the traditional Ottoman Room. Our guide, Ahmed treated us to the fascinating tales of the Ottoman Empire, gave us insight into the building and its construction, as well as the Islamic faith. For this shot, I used my Note8’s built in “Food Mode” feature, which allows you to take mouthwatering photos of food, by gently blurring the background and putting the food in the spotlight. Speaking of food, the complex has a number of authentic Turkish restaurants and shops that you can browse while you’re there. They also have a book-store and museum on the premises. We didn’t go to any of the restaurants this time, because we had just come from having lunch, but I am definitely planning another visit there soon! As for my Galaxy Note8, I’m in love with it! It’s so much more than just a phone! It is literally everything I need… phone, really good camera, office assistant (Bixby is pretty cool), plus it lets me multitask (way beyond what you’d expect) and it has really brought out the creative artist in me. Things just seem so much simpler now that I have a Galaxy Note8 with me all the time! I’ll tell you more about the features that I’m loving in another post, as there are simply too many to include on this post. All images were shot on my Samsung Galaxy Note8 with no additional edits, other than brightening certain photos in the native camera application. Just another way to #DoBiggerThings with the Note8. Previous Post For The Guys… New Fragrances Just For You!